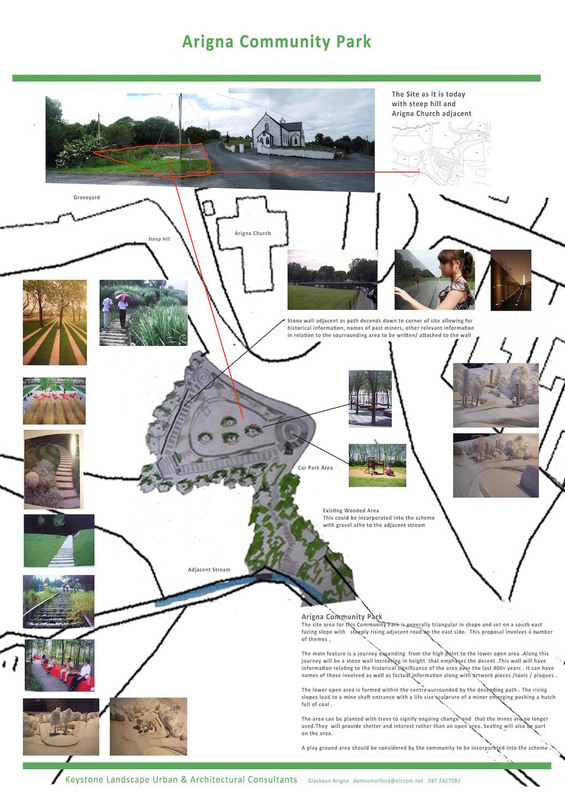 In 2012 dominick comerford architects was asked by the Arigna Community Development Company to review current ideas and make proposals for the development of an Amenity Park at a site offered as a donation to the community. A number of meetings were held in order to develop a brief. It was agreed that the community needed a park that reflected the mining heritage of the area and that provided a much-needed amenity for the village. The site survey and analysis demonstrated that the site was very suitable due to its location on the periphery of the village core, its elevated location adjacent to the main church and its proximity to the large open parking area below. A park in this location would strengthen the overall core of the village, remove the focal point from the shop and pub, provide a meeting/stopping place for both locals and visitors, could integrate a long-desired playground and would provide an opportunity to display and remember the 400+ year mining heritage in the area. The main feature is a journey descending from the high point to the lower open area. Along this journey will be a core ten steel wall constructed in sections which will increase in height along the decent. This wall will have information relating to the historical significance of the area over the past 400 years. The lower open area is formed within the centre surrounded by the descending path. The rising slopes lead to a replica mine shaft entrance with a life size sculpture of a miner emerging out pushing a hutch full of coal. The area will be planted with trees to signify the ongoing change and that the mines are no longer used. They will provide shelter and an interest rather than a large open area. Seating will also be provided. The ownership of the site has since been transferred to the Community Group and the project is currently under a funding application.